British (English) author and poet. Author of 'The Jungle Book', 'Just So Stories', 'Gunga Din', 'If', etc. Autograph signature on paper piece laid down by top edge on part of an old album leaf. Dated in pencil on the mount by the original collector, January 1st 1916. Approx 4 x 3 inches (excluding album leaf mount). Light foxing marks, else fine. 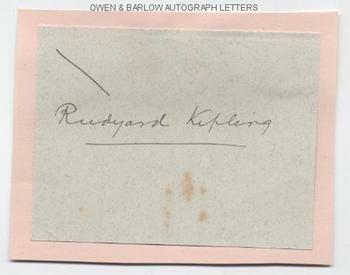 A large, bold signature and almost certainly a presentation autograph signature and not one which has been extracted from a letter or document.